this is the best place for buying high quality dog training equipment. no matter if you are a professional or amateur trainer, you will find here everything you need for successful training sessions and pleasant daily walking. Multi functional leather dog leash - All time most popular design of training dog leash with 2 snap hooks and floating ring. 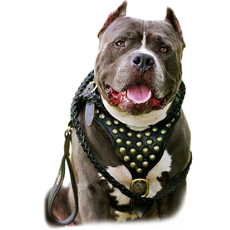 This leash is used by trainers, police officers and dog handlers all over the world. Wide and handcrafted this leash will become your favorite tool. Leather Dog Leash With Smart Extra Handle now available in durable high quality European black leather - Do you have strong large dog? Does your dog likes to pull? Does your dog takes you for the walk? Or is it you who takes your dog walking around? With this leash you will have much better control using the extra handle placed close to the snap hook. Multi functional 2 ply nylon dog leash - All time most popular design of training dog leash with 2 snap hooks and floating ring. 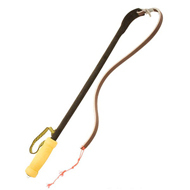 This leash is used by trainers, police officers and dog handlers all over the world. Wide and handcrafted this leash will become your favorite tool. Martingale dog collar - Buy today silent nylon loop/metal chain combination martingale collar. A martingale is a type of dog collar that provides more control over the animal with slightly different effect then this of the slip collar. It is similar in concept to a horse's martingale. Martingale Dog collars are also known as Greyhound, Whippet or humane choke collars. The Martingale dog collar was designed for Sighthounds because their necks are larger than their heads and they can often slip out of buckle collars. 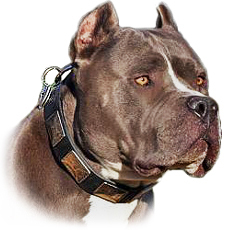 These collars have gained popularity among other breed owners in the recent past with many trainers now recommending them instead of choke chains, pinch collars or buckle collars. You should check with your trainer what is the best suitable collar for your dog. Martingale Dog Collars are fitted to the exact size of the dog's neck when the collar is pulled closed. Properly fitted, the collar will be comfortably loose when not in use. When the Martingale control loop is pulled, the two slides (hardware on the small control loop of the Martingale Collar) should pull close together but the two slides should never touch. So you are looking to buy dog harness and don't know how to choose right one? 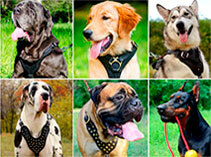 Here I will describe different dog harnesses types based on functionality and other factors. First of all you need to decide what the main purpose for purchasing dog harness is. 3. Walking your dog with better control. 4. Use harness as assistance mobility device. 6. Warming your dog's body when using harness in cold weather. 7. Using harness for guide dogs. 8. 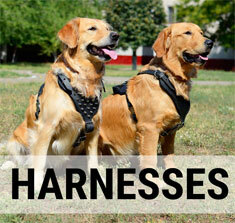 Harness can be used to identify certain type of working dog. 10. Assitance harness for older dogs. 11. Showing off by using designed or decorative dog harness. Pulling dog harness – can be used for exercising with your dog by attaching different objects to it and making your dog work hard while pulling those objects. Some of the examples of such objects are wooden box with sand, bricks or stones inside. You can also attach to the harness car tires of different sizes and weights. Here is another idea how to use pulling dog harness with more fun. Some of our customers do jogging, rollerblading or bicycle pulling by their dogs. 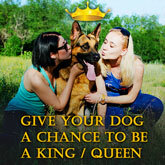 For this fun activity you should be very careful and approach it with maximum responsibility for your dog and yourself. There are more advanced types of pulling harnesses which are used for dog pulling competition. Most of working dogs breeds can learn how to pull on a dog harness. Depending on the climate and weather in your area you can choose between nylon pulling harness and leather pulling harness. Nylon pulling harness should be used in high humidity or rain/snow. On the other hand, leather pulling harness which is little more bulky is better, natural material for the dog and it also indicates in some way social status of the owner. Leather harness is also looks better on dog. Training dog harness – there are many different ways to train your dog and not for all you should choose harness. 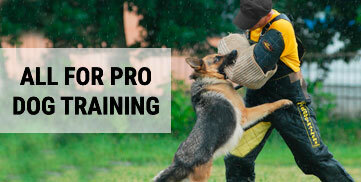 One of the most popular ways to use training dog harness is for attack/protection training. Well made durable harness can be used for police training, for sports, for schutzhund training, KNPV training, French ring, Belgian ring. What makes training harness a good harness, is its padding for dogs comfort, strength and durability so your trainer feels safe, balancing of the pressure from throat/trachea are toward chest area. Well fitted dog training harness helps dog to breathe right and with correct training intensity to stay longer focused on the training session subject. To better stay in control over trained dog we offer our training harnesses with handle positioned on the top as an option. Walking dog harness will help you control dog better. It is right product for well obedient dogs which have minor behavior issues, such as aggression toward strength dogs, strong prey or hunt drive. While there are many tools and techniques for dog's behavior corrections, such as choke collars, shock collars, pinch/prong collars, we see a harness as the most human way to apply correction to your dog when needed. The main reason is that harness will not hurt your dog in any way, it will just allow you to keep your dog where want your dog to be using reasonable amount of strength. Assistance dog harness- you should consider this type of harness for the dog whose job is to provide physical or mobility assistance. You will always find well fitted harness on the top of the assistance harness. 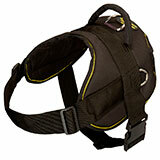 Harness used for assistance mobility is also reinforced with more padding on the breast area to add to dogs comfort. General durability and sturdiness of the harness depends on whether the dog is leading person gently, acting as a brace for the assisted person or actually pulling a wheelchair. Pulling wheelchair might also involve design change toward similar to sled dogs harness structure. Tracking harness is used for both sports and search/rescue missions. You need to make sure that your dogs movement is not limited by harness design, harness for tracking should be lightweight and preferably padded. Light weight of the harness will guarantee longer tracks distance, padding will help to avoid irritations at the most sensitive areas. 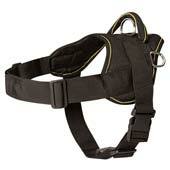 Tracking harness is made of nylon or leather. You should choose nylon when you are going to use it in contact with water. Coat harness or vest harness is the type of the harness which is made of cold resistance fabrics and will keep your dogs body warm during those cold winter fun walks. We make this harness with handle on the top so you can assist your dog when snow is too deep in certain places and you can of course attach leash to the ring which stitched into this harness, therefore no need to bring regular collar. Guide dog harness is specially constructed to be comfortable on the dog and allow handle usage as part of communication between guided person and guide dog. 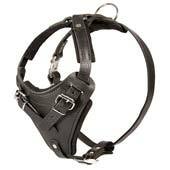 There is one most popular almost standard version of this harness. 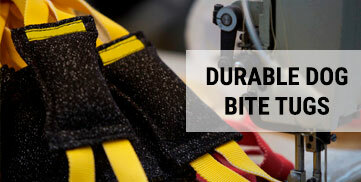 Identification dog harness is must item for many working environments. Military, police, security, search & rescue, patrol and many other working dogs should wear id dog harness as part of working environment regulation. Similar harness can be used for example when you don't want strangers to pet your dog. 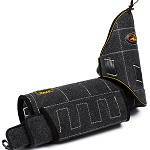 We offer id dog harness with removable Velcro patches. Some of the patches say security, police etc. while others say – do not pet, do not feed, etc. Rehabilitation dog harnesses are used to help injured dogs to go through therapy period and get well. Some of those harnesses remove tension and pressure from the problematic areas, some of those dog harnesses can be connected to special wheelchair, which helps to allow dogs movement in cases where back legs injuries are involved. 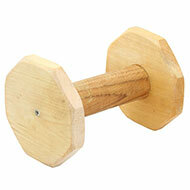 You can use handle located on the top to help lift your dog on the stairs or to vehicle. Assistance dog harness for older dogs is similar to rehabilitation harness and mostly used to help older dogs reach higher ground, get into the vehicle or climb porch or stairs. Finally designed and decorative dog harnesses bring a lot of color into your life. While we make sure to make decorative dog harnesses as functional as possible, by adding better control handle, by making it padded and making it ergonomic for your dogs body, main purpose of those harnesses is to show off your dog and gain appealing looks. By the end of the day with all the fashion we keep for ourselves, our dogs also deserve it. Another factor which you should take into account is budget – we offer large variety of dog harnesses which will fit any budget. You are welcome to contact us so we can assist your better in right dog harness choice based on your budget. Fittings – you might notice that there are few types of metal fittings which are used for making dog harnesses. How to know which type of fittings is the best and safest for your dog? I recommend as low budget solution to choose steel nickel plated. This type of fittings will give your harness strength and durability. In case your budget allows to please choose brass fittings. Brass fittings have all the positive qualities of the steel nickels plated ones and also known well as good material when it comes to dogs with sensitive skin and high sensitivity to allergic reactions. Size – it is very important to measure your dog properly before purchasing dog harness. While we help you to do it fast and easy based on our instructions and sizing charts/diagrams, please treat this task with responsibility as it will help you to avoid hassle of exchange of the dog harness for better fit. All our harnesses are adjustable to certain degree and if you are not sure which size to purchase and if your dog is not fully grown or falls in between of the sizes please do not hesitate to contact us for immediate professional assistance. Padding - for some of the harnesses we use natural felt padding. Should you look for this option? For tracking dog harness and training dog harness you definitely should. When else? Well, it is also nice to add some extra comfort to your dog's life. Padded dog harness will always cost more, but you might find that price difference is not so big, especially since you invest in dog harness for many years of use. Handle or no handle – while you pay few extra bucks for this future, you will enjoy using handle on the top of the harness as control device. When your dog is off the leash and you need to grab your dog fast and efficient when unwanted dog is around, handle is the best and easiest way to accomplish this task without hassle. Please note that most of the time handle can be added to the dog harness and the time of production. Common misconception is not to get handle for harness for smaller dogs. Consider this, while you are not going to lead your dog using this handle, many times it is the fastest and easiest way to lift your dog securely. Reflective trim – this important safety future can safe your pets life. All it does – makes your dog more visible in day light and many times can be the only thing which makes your dog visible in evening and night hours. Walk your dog safely and be responsible owner. 1.Is it safe to leave dog with muzzle on for the long time? Please make sure to observe your dog when your dog is muzzled. It is your responsibility and decision to leave your dog with muzzle on alone. I suggest always to keep your dog visible when muzzle is on. 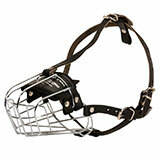 2.What is the difference between wire dog muzzle and leather dog muzzle? Wire dog muzzle provides your dog with better air flow and your dog can drink with wire muzzle on. On the other hand leather muzzle is better solution for winter and cold weather, also leather muzzle does not reflect sunlight. 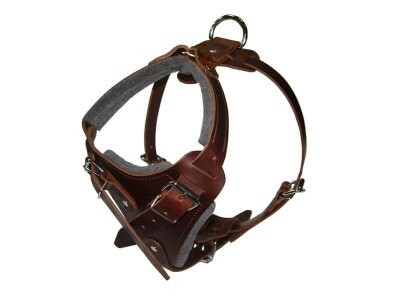 Some leather muzzles are lighter in comparison to wire muzzles. For some muzzle models it is easier to fit leather muzzle because its snout basket part not fixed. 3.What kind of muzzle is the best to take dog to Vet visit? I think that you need to consider muzzle which does not disturb your dog at all or at least interferes as less as possible with your dogs eyes and allows a lot of space inside to pant and breath easily. Most of dog owners use muzzles for Vet visits and those are only occasions where they use muzzles. At the same time if you do have muzzle which does not answer all the mentioned requirements yet does the job (was used already successfully for past Vet visits), then no need to purchase new muzzle. Please consider this super air flow dog muzzle for taking your dog to Vet visit. 4.What is the best dog muzzle for dogs transportation? Just as with muzzle for Vet visit I recommend muzzle which has enough free space for your dog to pant and breath with muzzle on. I think that with transportation muzzle it is even more crucial to make sure that air flow is good. The main reason is that you must keep your dog muzzled constantly through transportation procedure and for some dogs even the fact of transportation creates enough stress. 5.How to size my dog properly to make sure dog muzzle will stay at place and dog will not remove it? While it might look as a complicated task, I call you to be patient and spend few minutes to size your dog properly and as precisely as possible. I prepared very easy diagram and instructions to help you complete dog measuring for the correct fit muzzle. Sometimes you will need 2 pairs of hands to accomplish this task. 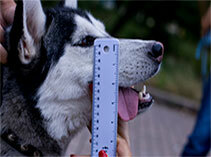 In 99% of cases when dog is measured properly, muzzle will fit very well. We do have fair flexible exchange policy but you will for sure prefer to avoid this hassle and get good fit dog muzzle at the first try. 6.Is muzzle adjustable so I can purchase it for puppy? This depends on the model of the muzzle. 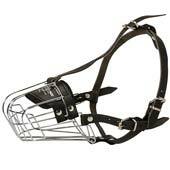 Wire muzzles are made with fixed shape cage part and with adjustable straps. Some of the leather muzzles are made with fixed snout basket part and some allow to adjust part which covers your dogs snout. Of course it is nice when you can purchase one product which will adjust as your dog grows. Unfortunately if you want your dog to enjoy proper functionality of the muzzle you must make sure that fit is perfect and this might cost you, as you will have to purchase few muzzles until your puppy becomes fully grown dog. But please consider all the suffering, outrageous Vet bills in case you try to save on muzzle and your dog picks up unwanted object from the ground during casual park or street walk. 7.Can my dog drink and eat with muzzle on? Most of wire basket muzzles allow your dog to drink. All you have to do is use bowl which is deep enough with high level of water. Your dog will figure it out. Wire muzzles also allow you to give treats, which can be very helpful by the way to get your dog used to wearing a muzzle. Some of the leather dog muzzles also allow your dog to drink but I would not recommend this. The reason is that once leather muzzle gets wet and dry, and wet and dry again it will compromise muzzles strength and will most likely result in bad odor. 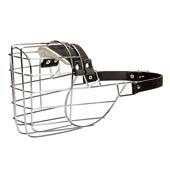 8.Do I need to purchase dog muzzle with steel agitation bar? You should consider model with agitation steel bar only for professional muzzle training. Police, military, security. 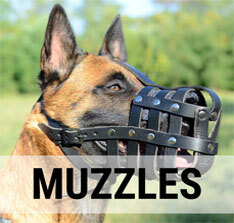 There is definitely no need to purchase muzzle with agitation bar for daily usage. 9.Do I need to buy dog muzzle which is padded? Since all our muzzles are padded you don't have to think hard on this one. I learned over years that padding is a must future for the muzzle to prevent irritation of sensitive areas of the dogs skin, therefore all our muzzles are padded. 10.Can my dog swim with muzzle on? Swimming involves breathing at greater rate, which will demand complete air flow and ability of muzzle to up stand corrosion after water contact. If you decide to purchase muzzle to allow your dog swimming, please remember it is your responsibility and please make sure that you observe your dog constantly and close to you during this activity. We make and offer so many different types of dog leashes that I have decided to write this guide which will help you better understandthe different types of dog leashes and help you make the right choice for your needs. There are a few factors which divide the world of dog leashes into a few main groups. These factors are – material, which is used for making the dog leash, length of the leash, width of the leash, type of snap hook and functionality. I do not refer here to the cost factor, since all our leashes are priced lower than any other leash of similar quality in the world. Now allow me to focus on each group of leashes step by step. 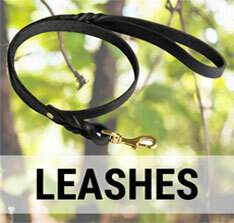 Different types of leashes : cord leashes, leather dog leashes, chain dog leashes and nylon dog leashes. Nylon dog leashes are perfect for a lower budget and great for using in any weather including rain, snow and wet climate. You can use leather leashes in any weather as well but please make sure to apply leather conditioner from time to time to keep your leash in firm condition so you can use it longer. 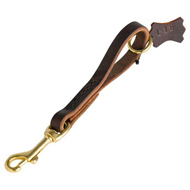 Nylon leashes do not stretch at all, leather leashes have a natural stretch rate which should be minimal for good quality leather. 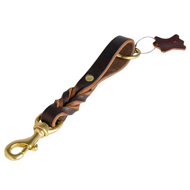 In case your dog likes to bite his leash or chew it from time to time I would recommend a leather leash, which will better hold up. Leather leashes look nicer and always indicate social status of the owner. As for the strength both the nylon and leather leashes are very strong. 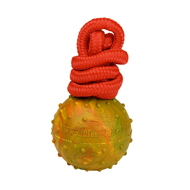 In case your dog is a hard chewer you should consider a chain leash which might discourage your dog from chewing it. Please make sure to observe your dog when you purchase chain leash to avoid tooth problems. Length of the dog leash – the shortest leashes are about 1 ft long and are used for short control – usually called handle leashes. A longer leash gives your dog more freedom during walks but offersless control to you as handler. I think that ideally for best controla leash should be 4ft-6ft long. This kind of leash is the best for walking your dog in the park or for training. For tracking you should considera longer leash which can be up to 150 ft.
You can probably use a longer leash also for walking if you live in an area with a lot of space or fields. 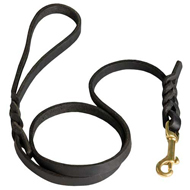 The width of the dog leash – while leather is a very strong material, the width of the leash will affect its weight and additional strength. For smaller dogs we make leashes which are 3/8 or ½ inches wide. 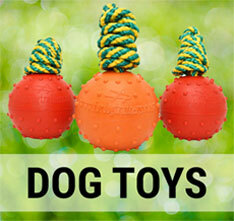 These are great for dog shows and for obedient dogs. 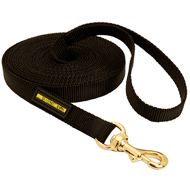 For stronger pullers powerful dogs and for large dogs we make leashes which are ¾ inches wide. All our nylon dog leashes are ¾ inches wide. Of course wider leashes are made with bigger snap hooks which will also make the leash stronger and heavier. The type of snap hook on a dog leash- Itis very important to use a reliable snap hook as it connects betweenthe leash and your dog. The snap hook should be strong, smooth and easy to open/close and should havea mechanism which will prevent accidental openings. There are hundreds of snap hooks some of which only look impressive but will not hold on for a long time. Over 15 years of experience we have found some specially high quality and functional snap hooks which will hold up for years. These are the polished brass traditional snap hooks and the quick release Herm Sprenger snap hooks. The main advantage and difference of the quick release snap is that it will lock harder with your dog pulling and applying pressure on it. At the same time you don't have to pull your dog to open the snap, all you have to do to let your dog off the leash is to press 2 fingers on the snap hook of the leash. This snap hookis widely used by police and military, since critical situations in thefield ,split second decisions orcriminals can't wait for thedog to bereleased. You will love this special police snap hook as well. On your daily walks you can release your excited dog to run free in the park easily, hassle free and fast. 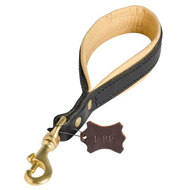 There are few other snap hooks which are described in details in the dog leash product page. Functionality of the dog leash – many times this is the only question you need to be answered to know which leash to order. For dogtraining leashesplease consider the6ft long leash. Extra functionality can be achieved by orderinga floating ring on the handle. For tracking you will needa long leash – check with your tracking group which length dog leash to order. For agitation training please consider widea 4-6 ft long leash. 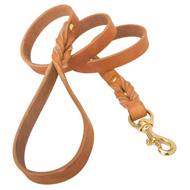 For city lifestyle please consider our 2 handle dog leash. For dog show please have a look at our show leashes – these leashes are less strong but have decorative additions for visual impact. For police and military please consider our multi functional leash – it is also great for every day dog walking. I make and offer close to a hundred different types of dog collars. If you count all the brands, types and models available in stores and online you will probably drown in a sea of information. I want to teach YOU in 5 minutes how to make the right decision and save money on your next collar purchase. I will speak about the collars which I make and offer on this website. As with any purchase, I want YOU to decide what is the main priority factor according to which you are going to make a decision: Budget, functionality, material or size? You can also combine these and I will talk about all the keys for making the right decision. Example: A 1 -inch wide collar will be less comfortable in comparison to a 3 inch wide collar because all the pressure will be applied over a smaller surface area. Recommendation: If you are not sure which width to buy, please choose the 1 ½ inch width, which is the most popular and functional average collar width for most of the bigger size dog breeds. • For minimum adjustment - measure the neck circumference right after a haircut. • For maximum adjustment - measure the neck circumference when your dog has the longest fur. Our standard adjustment range is 4 inches (the distance between the smallest and largest adjustment hole of the collar). Four inches will cover both states – with or without fur. If you feel that you need a larger adjustment range please contact me and I will be happy to accommodate you in most cases. Sometimes an additional fee will apply. Another exception are overweight or underweight dogs. In these cases, if you are planning to put your dog on a diet, you should take into account how it will affect your dogs dimensions. This may result in a collar that no longer fits. Please note that if you are going to use the collar on its smallest adjustment hole there will be an approximate 5-6 inches of extra collar length which you might want to cut off. Another tricky situation is acquiring a collar for a puppy. The best thing to do is to choose a low budget collar until your puppy is at least 10-12 month old. Example: For a 6 month old puppy with a neck size of 15 inches - purchase a collar which will fit 15-19 inches. Warning: The biggest misconception is to measure your old dog collar and hope that based on this information you purchase a good fitting collar. This is wrong. What you need to do is measure your dogs neck circumference and choose the size of the new collar based on that. You can measure tightly, there is no need to add a finger or two because because all of our collars are adjustable. Example: If you need to buy a collar for an adult German Shepherd with a neck size of 20 inches (your dog never gets haircuts). In this case choose a collar which will fit a 20 inch neck size. What you will receive will be a collar with an adjustment range between 18-22 inches. The first hole will be close to 18 inches and last hole will be close to 22 inches. A total of 5 adjustment holes. Budget – We work hard to keep our dog collar prices the lowest in the world. We have a wide price range of collars. Some collars are more expensive, these collars are more intricate and unique in their design. Remember, you get what you pay for. 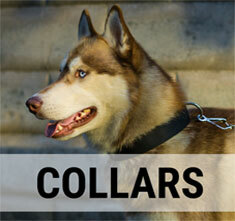 We have fine collars which are under $19 and still provide you with great quality and your dog with super comfort. There are also many wonderful collars within $20-$35 price range. Material – I offer leather, nylon and metal dog collars. Nylon- Choose a nylon dog collar if you want an easy all-weather dog handling solution. No need to take of, is suitable for walking your dog in the rain, snow, swimming and high humidity climate. These collars are extremely strong, light weight and reasonably priced. Leather - Choose a leather dog collar if you want a safe natural material collar which looks better with age as it absorbs the fur oils of your dog. A leather collar can serve you for a life time. Just make sure to treat it occasionally with a leather conditioner. Leather does not like water but when you apply a conditioner, you can allow your dog to get in wet. Leather collars are perfect for dogs which tend to have allergy reactions when in contact with metal or nylon. They collars are also perfect for dogs with skin irritation problem. 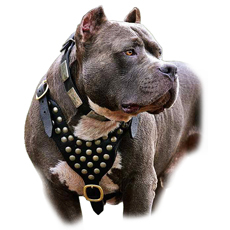 Metal- Choose a metal collar when you are looking for a special collar which will allow behavior corrections. Consider stainless steel collars for safe water contact, they will not rust. Consider a Curogan collar to avoid allergies and irritations. At this point you should know what size, width and material to choose. Finally we approach most complicated question – functionality. When well explained (I will do my best to make it easy and well explained) it is not tricky at all. 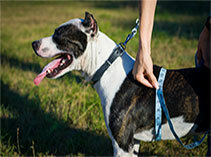 1.Collars which their only function is to allow the handler to attach a leash. 2.Any other collar which has an additional purpose – training, identification, behavior correction etc. Regarding the first group, if you follow my advice about selecting an appropriate collar width and length, and assuming that you decided what material better suits your dog, it all comes down to your personal taste. That's right, simply look at the pictures and get the collar which in your opinion will look the best on your dog. If you are having trouble deciding between a few different styles? Simply contact me and I will check about a bulk discount to make it easier for you. The second group is a little bit more complicated but let's figure it out together. 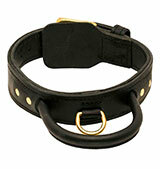 * Choose an extra strong collar with a handle if you are planning agitation (attack protection) training with your dog. * Choose a martingale type collar if you want to be able to apply behavior corrections and want to be able to put the collar on and off fast. 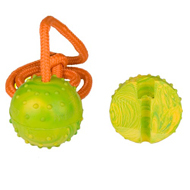 * Choose a pinch/prong collar if you want advanced control and corrections ability over your dog. This type of collar will probably suit best people with limited amount of strength and older dog handlers. * Choose a choke chain collar or choke chain fur saver (choke collar with bigger links) to be able to train your dog and make corrections. These collars often go in combination with a regular buckle collar. * Looking for the collar to take your dog to the dog show , choose our dog show collar. I hope after 5 minutes of reading and learning about this subject you are much more confident about how to choose the most appropriate collar for your dog. If you have any further questions , please feel free to contact me for further assistance. Thank you for reading this educational article. I hope you enjoyed.